InkyBlackness is an open-source project for creating modding tools for System Shock (1994 and compatible). Any useful by-products are happily created, and not the main goal otherwise. The problem domain is the old DOS game System Shock (1994). 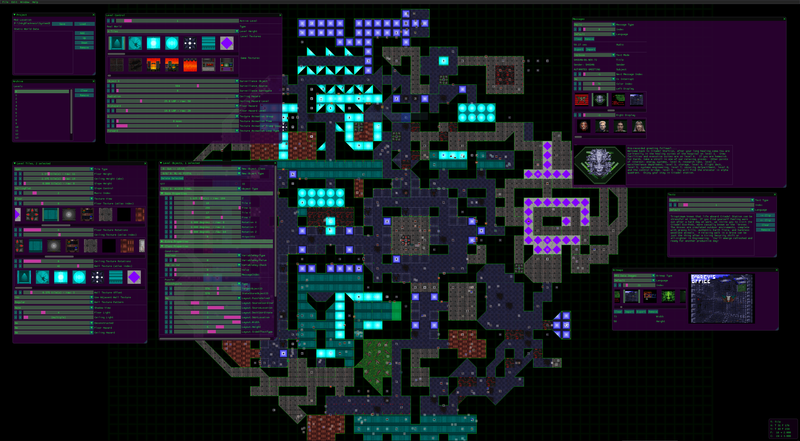 The current focus is on creating a fully capable data, resource, and level editor for the game. It is meant to create compatible files for both the vanilla game, as well as the re-releases, such as the extended edition (SS:EE), and the "source-port" including compatible derivatives. The related sub-project is ss-specs, the documentation of the data files. This project, with the help of the other supporting sub-projects, is set up to allow easy contribution on any finding. This graphical editor is the all-in-one editor for the game. The related sub-project is here. Download the latest release here. Its user documentation can be found here. Follow the official forum thread about its releases on the systemshock.org forums. A dedicated YouTube channel exists, with tutorials and show-cases of modding. Discuss the tools and the System Shock game series in general on the community hub www.systemshock.org. Two sub-forums are relevant: Deck 13 for source-code related discussions, and Engineering for game modding discussions.